"Come on, let's free climb the Titan." "No one dies from being ridiculous, but you could die on the Titan, so it can't be ridiculous." Alice-in-Wonderland arguments are appropriate in the Daliesque spacescape of the Fishers; so are fear and moaning. 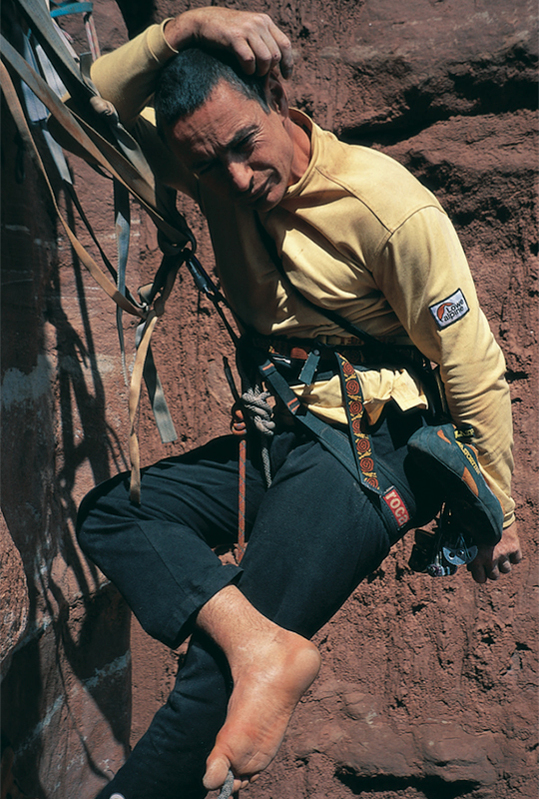 Having failed to free climb the Finger of Fate route on several occasions, I was amazed when Andy Donson, who had clean-aided the Sundevil Chimney and freed the penultimate pitch, said it might be a goer. Crusher (aka: "the Mad Hatter") had also been trying to get me to try it, but, as with alpine climbing, defeat in the Fishers often takes place before the climbing starts. But then dreams of conquest come alive again at the bottom of a bottle of Laphraoig. The first two pitches of the Sundevil overhang a tad and are on colorful rock with brilliant protection, which, however, didn't prevent me from taking three sixty-footers. Call that careless, use expletives both French and English, but it does air the bats in your belfry. These two pitches are as good as anything in the desert and will probably be done just for themselves, but the next pitches, in the chimneys, may fray the nerves more, being loose and gravelly. They require gritstone technique, albeit on mud. You will feel like Quasimodo tugging on the draperies of a Stone-Age cathedral as you bridge and bluster your way up, with a big drop tugging at your balls—but you will definitely feel alive. A nasty delicate section—all grace and poise—slapped me into the slab a few times before I summoned the seldom-used gritstone udge. Pro here was a six-inch hook and a tied-off nut-broddler. Pitch 5 was disappointingly solid and straightforward—until all points of contact let loose except for a foot cammed into a bucket of guano. The wide crack above is OK, although I was in no condition to understand that at the time, as I had reached the babbling stage. 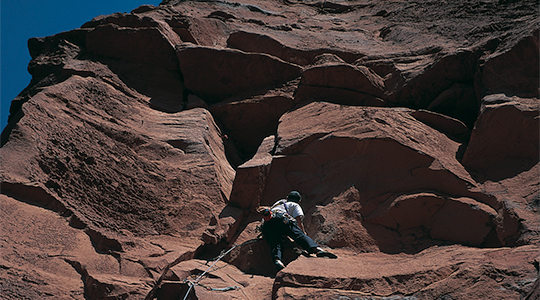 You then arrive at a wide, comfortable ledge and belay attached to a friendly and considerately placed gargoyle. If at this point you feel as though you're in the chess game in Alice's Adventures in Wonderland don't worry; everything is fine. When Laurence joined me here she pointed out I had dried froth at the corners of my mouth, and she asked about a stain around my groin. I still insist it was bat guano. From here the top is within sight: a nasty-looking crack with large, blownout peg scars that don't like taking pro or hands or feet, followed by an easy chimney pitch. I found the crack very hard—but then again at the time I was fighting a lusty urge to be in Acapulco. You should top out just as the sun goes down, inappropriately dressed, bonked out and bleeding. Stare at the slowly appearing stars and know you have climbed a giant beanstalk of sand laid down eons ago—and know further that you have many things in common with people who think the moon is made of cheese. Rapping in the dark down the overhanging pitches goes surprisingly well until you rap straight into the ground with a thump. Freeing the Titan is harder than, and took me longer than, doing the Eiger but is of the same genera and has left me with a powerful souvenir: a totem in the mind. The Fishers are one of the most powerful and magical places I have ever been. I did more climbing in the year I did the Sundevil than in nearly all the others I have been climbing, and it was the best route I did. There's a downside to this: being just six feet above a bolt felt a bit bland afterward. There are many towers in the desert but only one Titan.